Velvet is back y'all! When I think of blazers, the first thing I think of is work wear. But when I saw this green velvet blazer, my first thought was Christmas Party! The color is perfect for the holidays (comes in black and cabernet too!) and the price can't be beat! Yes, it's under $50! I also want to take a second and talk about these heels. Shoes so nice I bought them twice! I'm not kidding, I also bought them in beige because I loved them so much. They are super comfortable, easy to walk in, and I love the sweetheart topline! Oh, and they're under $30! The perfect heel for any occasion! You look so festive and chic! I love the sweetheart topline on those heels! I love that velvet! So adorable! Where was this blazer about an hour ago when I was looking high and low for a Christmas party outfit! I just love it! And it's my favorite color! This is such a gorgeous blazer girl, the texture and color are so beautiful! That blazer is perfection! It's perfect for the holidays. You look beautiful. That's such a pretty color on you. One of my favorites. Great pictures. wow! love that green blazer! What a nice change from traditional red for the holidays!!! 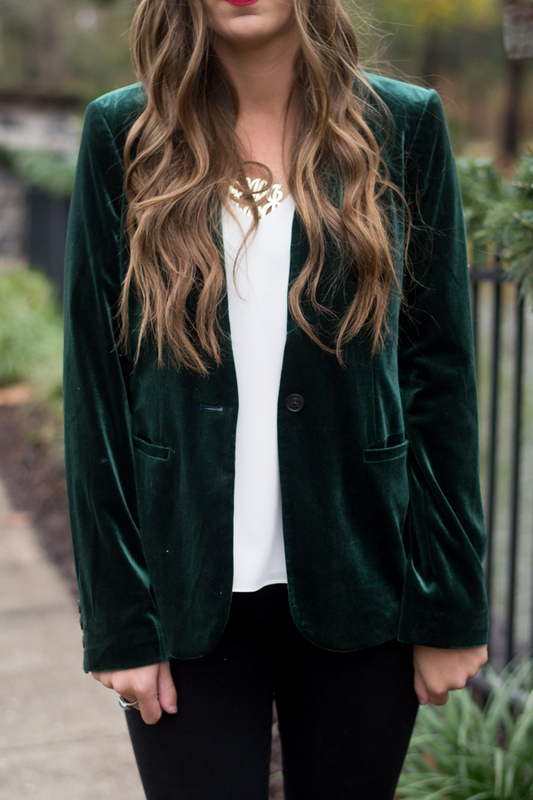 Alright, you've just convinced me - I need a green velvet blazer for this holiday season. Seriously, how gorgeous are you!? Major love for this festive look! Anything hunter green is what I'm loving right now! This blazer is fabulous. 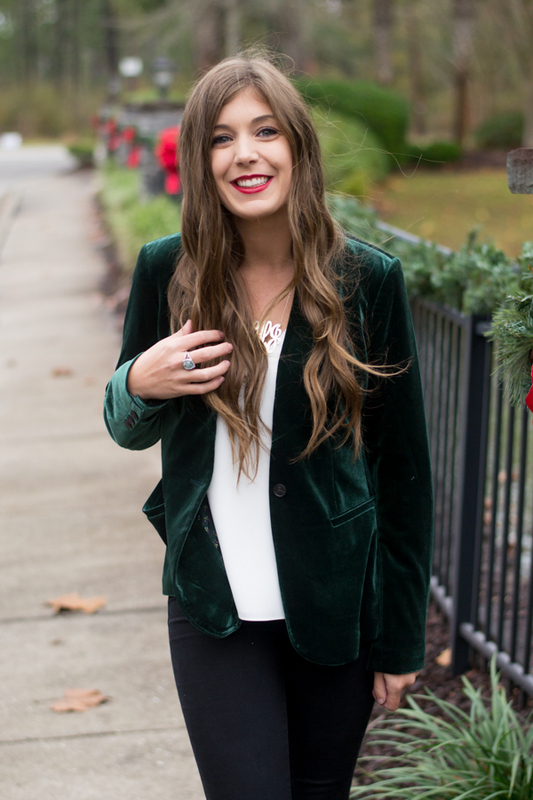 I never knew I needed a green velvet blazer until now! So pretty and festive! That blazer is perfect- so festive!! You look so adorable and party ready! Wow that blazer is stunning on you! 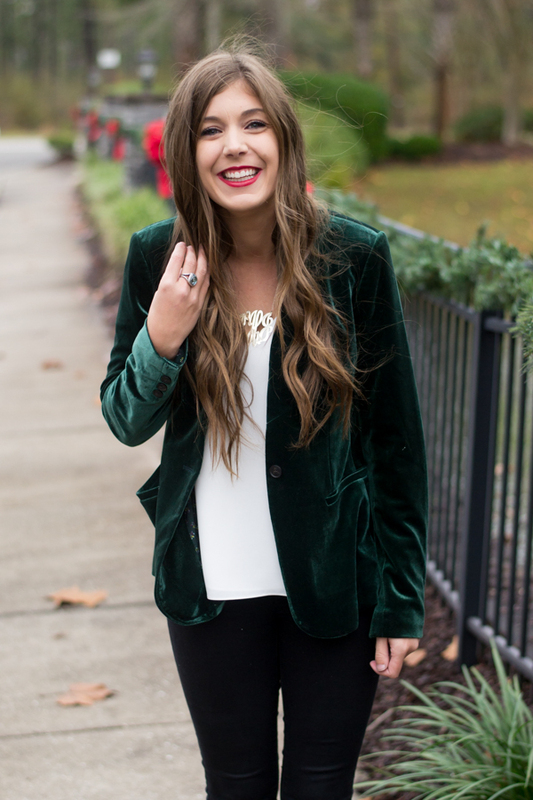 I love the velvet for the holidays:) So gorgeous!! That blazer is PERFECTION! I love it for a holiday party!